Have you ever wondered how high you're supposed to hang your artwork on the wall? Or how far apart you should place your frames from one another? 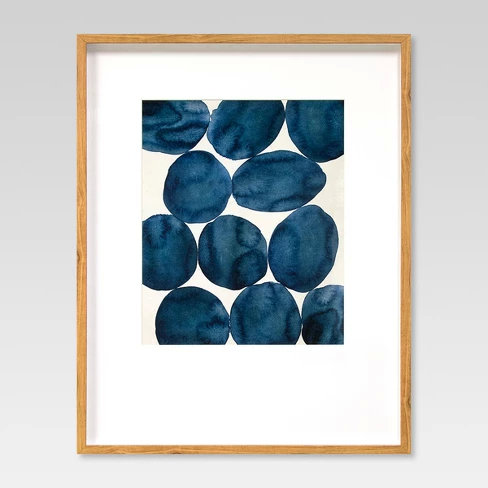 There are actually guidelines for hanging art on the wall and I’m going to share all the designer tips with you today! Shall we dive in? Psst, I linked the furniture and artwork below so you can shop these looks. When hanging artwork above furniture, aim to position it approximately 6-8" above the furniture. When hanging artwork too high, it feels disconnected from the furniture and looks as though it's floating. If you're hanging artwork on an empty wall, hang it approximately 57-60" from the floor to the center of your artwork. It should be eye level for an average height woman. If you're working with multiple frames or creating a gallery wall, position each frame approximately 3-4" apart. Keeping them close together will help the eye to see the art as one unit. When choosing the size of artwork for your space, ensure that the artwork will fill 2/3 the width of the furniture it will hang over. If you use artwork that is too small it will not feel balanced. Pretty simple right?! Are you following these guidelines? Let me guess, you’re about to walk around your house and see if your artwork is hung right! You do that. :) But before you go, hover over the image above and click the Pinterest “save” button so you can remember these rules later! Ok, that’s all for me! If you liked the furniture and artwork I shared above, click the images below to shop these pieces!